I continue to be amazed by the talent and creativity I see in the blogs I visit. Often, having spent the day in an assortment of unplanned, often unnerving, activities, the dinner hour is approaching and the blogger has absolutely no idea of what to prepare. A look in the pantry, a scan of the fridge, and within minutes a delicious dinner is on the table while a tasty dessert awaits on a countertop. OK, that may be a bit of an exaggeration but the point remains. Many of you can create fabulous dinners on a moment’s notice, using only what you find in your kitchen and pantry. This is so not me. If caught with nothing planned for dinner, I can scan my cupboards or stare into the fridge for hours and I’ll end up with the same 2 dishes: a sandwich from a previous night’s roast and, when there’s no roast, some sort of pasta. Today’s recipe is a case in point. You see, this is not the recipe I had planned to share today but before I get into that, please take a look at the image to the right. Examine that box very closely. Everybody done? Good. Now, do you see anything that would lead you to believe that there are anchovies in that box? Anything at all. Of course not. So, why did I buy it, mistakenly believing it contained white anchovies — the ingredient that was supposed to be featured in today’s recipe? Worse yet, that box sat in my cupboard for 2 weeks, visible to me countless times during that period. Yet, incredibly, it wasn’t until I opened the tin late last week that I realized my mistake — and then I had an open tin of sardines to deal with and nothing for dinner or today’s post. Now, I could have taken the easy route and just substituted the sardines for the anchovies but that would have cost me a perfectly good pasta recipe that uses white anchovies, as you’ll see in the weeks ahead. No, I had to think of something else and, thankfully, I remembered an ingredient Mario Batali had used recently. So, I went to my stash of canned goods, specifically the hot cherry peppers I pickled last September, and the result was today’s dish, a pasta much like an Aglio e Olio. To recap, a typical aglio e olio uses olive oil, garlic, and red pepper flakes to dress a spaghetti-like pasta that’s topped with grated cheese and freshly cracked black pepper. The red pepper flakes give the dish a nice even heat that can be as bold as you like, unlike today’s dish, where the chopped pickled peppers give bursts of heat, as well a touch of acid from the pickling liquid. Of course the sardines give this dish an entirely different flavor profile from your everyday aglio e olio and, because of them, grated cheese should not be served with this dish. So, to top the dish off, I used the Bartolini breading mixture that was lightly toasted beforehand. And the result? Well, it was so good that I’ve promised Zia I’d prepare it for her when I visit next. In a small mixing bowl, combine 1 diced/grated garlic clove, bread crumbs, and 2 tbsp of olive oil. Season lightly with salt & pepper. Mix thoroughly. In a large frying pan over med heat, add the remaining olive oil. Once hot, add remaining garlic and sauté for 1 minute. Add the pickled peppers to the pan and continue sautéing for another minute before adding the sardines. Continue sautéing until the pasta has cooked 2 minutes less than the package’s cooking instructions indicate for al dente. If you’ve timed everything correctly, you should sauté the sardines for no more than 5 minutes before the pasta is ready. Add pasta to the pan containing the sardines and peppers. Gently toss to evenly coat the pasta. If too dry, add enough pasta water to create a sauce. Continue to sauté until the pasta is al dente, 1 to 2 minutes more. If you’re one who enjoys cooking Italian dishes, preparing aglio e olio is a dish you really should learn. The basic recipe involves using garlic-infused oil and red pepper flakes to dress pasta but that’s just the start. Today’s dish swapped out the red pepper flakes for hot cherry peppers and added sardines to the mix. You may wish to keep the pepper flakes and use some vegetable(s) instead of the sardines. No? How about some shrimp? What you choose to add or subtract from the garlic-flavored oil is totally up to you but the result is sure to be a flavorful dish of pasta. Best of all, you can go from staring into your refrigerator to dining at your table in under 20 minutes. To be sure, not everyone has pickled cherry peppers in the pantry. Most groceries do carry them, however, but you could use peperoncini instead. Still, no matter which pepper you use, I suggest tasting one beforehand to see if its level of heat is to your liking. Having referred to it a number of times, I’ve little choice but to feature our Aglio e Olio recipe as this week’s Blast from the Past. The dish couldn’t be easier to prepare and the post contains a favorite memory of my Uncle. You can read both by clicking HERE. This entry was posted in Family Recipes, Pasta/Rice/Soups (Primi Piatti), Vegetarian and tagged Cooking, Food, Italian, Pasta, Recipes, Sardines by ChgoJohn. Bookmark the permalink. Oh John, I can’t do sardines…but I absolutely love every other ingredient! The dish looks very taste and beautifully out together. In actually pretty good at whipping something at the last minute. I have found some of my best recipes that end up on my blog are the ones I just threw together…of course I have flops too that don’t work out. It’s weird though….I seem to work better under pressure and less thinking involved, haha! That’s so sweet John, thank you! It’s a challenge for sure, but tons of fun! That made me laugh out loud when you said “to not make it” lol!! You’re so kind to me, Barb. This dish is hardly inventive. As I mentioned in the post, once you learn the aglio e olio recipe and method, you can make a pasta dish out of just about anything. Sautéed vegetables work wonderfully and, if you get tired of them prepared that way, roast ’em first in the oven before adding them to the pasta. You’re such a talented cook, Barb, that you could easily do this. If this isn’t your style, I’ve the white anchovy pasta coming up in a couple weeks. C’mon, give ’em a try! We live on the sardine coast of France. I think sardine canning was first done just up the road in St.Gilles Croix de Vie – anyway they had huge sardine fleets there in the last century. Things have changed in this modern world, but you can still buy “millesime” canned sardines there, which have the date of the catch and the name of the boat, from the fleet that still works there, on the can. Of course, their market is full of sardines, and fish of every kind. Tuna’s big there too. The long and the short of it, John, is that I love sardines and eat a lot of them. I’ll be checking out this recipe. Thanks, Celia. The thing is, I’d never seen this type of sardine either. Maybe that’s why I thought them to be white anchovies when I saw them pictured on the box. I’m glad I’ve found them, though. I just wonder what else is on that shelf at the market? Thank you, Giovanna, but hardly genius. Once you learn how to make a pasta aglio e olio, you can use just about anything to make a good dish of pasta. With your knowledge of food on both sides of the Atlantic, I bet you could make a number of great pastas. Alls well that ends well they say John and you ended with a gigantic success! Think I have only ever eaten regular anchovies so I am excited to hear about their white cousins. Thanks, Mandy. I’m sure most people will enjoy white anchovies. They’re not as “harsh” as their cousins and nowhere near as salty. Plus, they make a good dish of pasta! Mmh sardines! Surely they deserve more attention – this dish looks wonderful. I’m not a fan of pickled peppers, I guess maybe steamed bell peppers work as well? Thanks! Yes, you could steam the bells or sauté them in the oil. If you go that route, maybe some capers would replace the missing “pickle” flavor. Granted, they’re not the same but the effect — a pop of flavor — would be the same. John, the seems to be a wealth of Blue eye at the moment…………..can’t wait for the Cod recipe. No pressure of course. Blue eye or blind, I had a good chuckle over it — and then I realized i had nothing for dinner nor for today’s recipe. Panic is the mother of invention in my kitchen, Elaine. I’m just glad it worked out. As for the cod, my Zia was thrilled when I asked her about the recipe. It’s been ages since any of us has grilled it. I hope you’ll like it. Does your beloved Zia know how famous she is on the other side of the world! All the southerner’s waiting for her next recipe. Thank you for leaving such kind words. I’ll be sure to relay them to her this evening when we talk. The picture is fabulous. When I wean us off the Bartolini Sausage Ravioli I shall be trying this recipe!! There just isn’t enough meals in the day to try everything I see. Oh, Maria! You’re too funny — and very generous with your comments. Thank you so much. I, too, love the story of your late night suppers with your Uncle. What a wonderful visual. And your photos are great on both posts. Making everything so inviting and ready to add to the dish. The completed dishes are always making us salivate and wish we were at the table with you sharing. Knowing that when you prepare it, it would be perfection. My sister used to eat sardines right out of the tin and those little guys always looked so oily to me. Not like your pretty can’s illustration. This season of fish eating is going to be a good one if everyone follows your guide. Thank you so much, Ruth. Those late night dinners with Uncle were very special. I was surprised to learn that Zia knew nothing about them. That made them even more special. I often think about the fact that I post a nice recipe every week or so but eat frozen pizza and other short cuts throughout the week! Necessity really is the mother of invention John and you’ve proven that here. Looks like opening those sardines was a happy accident –one that we have all benefited from. I am thinking I could make this with and without the sardines for the girls… Must try the Bartolini bread crumbs! Thank you. I’m much the same, Barb, and don’t eat like this every night — and I haven’t children to care for. I don’t know how you parents do it. As for the bread crumbs, my family uses them all of the time. On fish, vegetables, pasta, even some meats. It’s a great way to add flavor and keep the moisture in. I’ll be using it twice again during the weeks ahead. I hope you’ll like those recipes, too. Love the sardines and you know I’m fond of the pickled cherry peppers! I’d never think to put them together! This looks like a great weeknight meal! Thanks, David. You made this meal possible! I’ve also got some small bell peppers, “tulip bells”, that I pickled and will be using in a salad later. Next Summer I’ll be pickling quite a few more peppers of all kinds, to be sure. I adore sardines – fresh and tinned. In fact I have many happy memories of my English grandmother making me tinned sardines on toast (with plenty of butter) as a special breakfast or tea time treat as a child! Love store cupboard suppers and I think we’ve all made msitakes with things that we’ve bought in error that turn out to be surprises! Actually, this reminds me of another English Grandmother story – we were travelling as a whole family to Italy by train (the car went on a special wagon at the back with all the other cars) and we had to load up with 2 days worth of food for 6 people (my parents, my grandparents & my brother and I). Great fun it was too. In those days there was no long life milk and my grandmother had packed milk powder for coffee (we children didn’t drink it black) but in error had bought a packet of instant mashed potato, put it into a container and the error only became evident when we were faced with dark brown lumps of coffee flavoured potato floating in our little coffee cups…a story which is now a family favourite! Oh, Tanya! There just has to be some genetic link between our families! That’s too funny! Over here, people always reminisce about “Mom’s lumpy mashed potatoes” at Thanksgiving. Grandma’s lumpy coffee is a new one. Still, packing food for 6 people for 2 days, without refrigeration, it’s a wonder that the only problem was with the milk powder. Love it when a mistake turns out for the good…and a dinner that’s ready in under half an hour falls into that category, for sure! As you know, Marie, with an aglio e olio base, you can whip up a batch of pasta with just about any other ingredients. Quick and easy. My kind of dinner! A dumb question, why would one not serve grated cheese with this dish because it contains sardines? Adding anchovies to a pasta dish seems normal to me but never thought of adding sardines to a pasta dish, Glad you shared your mistake turned keeper, one more recipe for the Bartolini cookbook. Will file this away for the future. Thank you, Norma. I’m honored that you’d find our recipes worth saving. I am learning a great deat about Italian cuisine from your posts and have saved quite a few of your recipes. Thanks for clearing up the “No cheese” with seafood. I will pay more attention when I am watching an Italian cooking program that features seafood. Wondering: what if I ordered a seafood dish at an Italian restaurant and ask for grated cheese, what reaction would I get????? May just do that one of these fine days. Depending upon the restaurant, Norma, the waiter will point out that cheese isn’t normally served with your dish. If you persist, many waiters will get you the cheese. Sometimes, though, they will refuse t do it. It all depends upon the restaurant’s management how they handle it. Not a problem, Teri. Cod’s up next week! Wow! Good for you John, this looks and sounds delicious!! Now that’s talent…putting this together after you realized what happened. I could never do that. The sardines would go back into the pantry until you, Ina or Chef Anne told me how to use them, lol. Hubby will enjoy the heck out of this John. Thank you! Thank you so much, Sarah. THis really is a no brainer. Once you learn that aglio e olio recipe, a whole new world of pasta making opens up for you. You can ad pretty much anything to that sauté pan and wind up with a good pasta. I was just lucky to have the pickle peppers on hand, too. I will be making this again, that’s for sure. 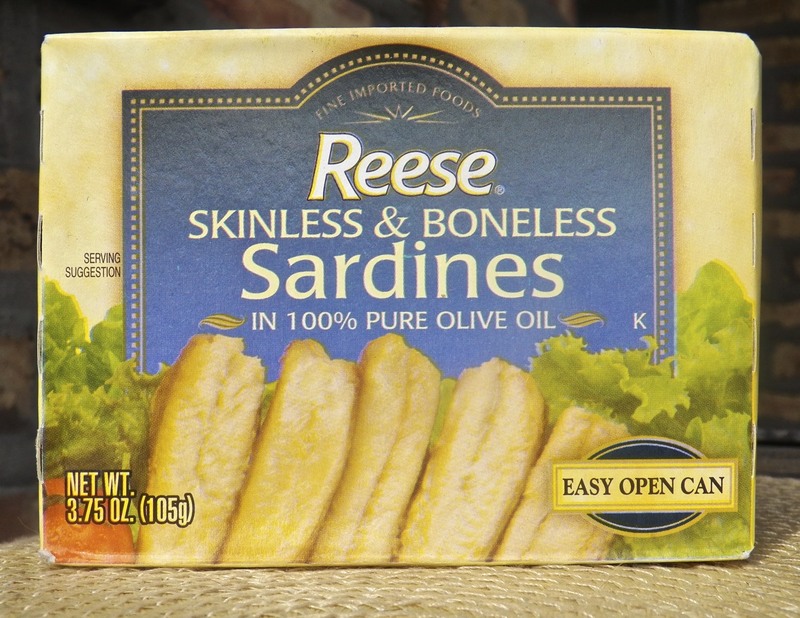 I’ve never had a sardine (perhaps only in salad dressing), and frankly I’m sort of scared. However, you included the pickled cherry peppers (genius) AND I trust your culinary expertise, therefore, I would absolutely give this a try! Here, YOU marveled at the ability of others to create dinner on the fly, here you do the same! Thanks you, Tanya. You’d be surprised. This pasta isn’t at all as “fishy’ as one would expect. Granted, it’s not totally bland but it’s milder than I thought it would be. I really don’t put this pasta dish in the same class of some of the dinners I’ve read that people have put together, at a moment’s notice. That is just not within my capabilities. Love the post, John. While many of us never consider ourselves to be “creative” or “imaginative,” as they say, “necessity is the mother of invention.” Whether in science, arts and crafts, or cooking, etc., one you learn a technique you can adjust it to fit the circumstance. In your case, the aglio e olio is adapted to fit what you had. Viola! You have an inspiring, creative and tasty meal to share with your blogging friends. It looks and sounds delicious. This summer I need to find some little cherry bomb chiles and pickle them so I give this recipe a try. It sounds like it’s packed with flavor and a little touch of heat, just the way I like it. John, I just found the fresh little cherry bombs at my local market. I was stunned they were available. So, I immediately came to your blog to find your pickled cherry pepper recipe. Alas, I cannot find it. 😦 Would you be so kind as to e-mail me the recipe? Hi John, oh, what a lovely dish! I love-love-love sardines! (Did I say it enough times?) 🙂 Sometimes I just open a can and make myself a sandwich: sardines on a slice of bread, nothing more! Last week I was in Seattle, and went to a fish market. While there I thought of you: they had so many fish varieties that you would like (and I like it too!). I didn’t eat anything but fish or seafood while there. Oh, those cherry peppers are delicious, haven’t seen it in a long time though. Not even a chance they sell it here, but I’ll keep my eyes open. Great meal! Oh, Marina. Thank you so much. Your stay in Seattle sounds just like me whenever I’m near the coast, any coast. I fill up on seafood as if I’m a dying man and only fish will save me. When in Italy, it’s as if aI have a checklist. Pasta with salmon, with clams, with sepia, I could go on and on. I, too, love those cherry peppers. I searched for them all last Summer, at a number of farmers markets, and never saw any. Finally, at Summer’s end, my Italian market got some in. I may plant a few plants this year just to make sure I have some to pickle. This pasta was too good to take a chance of going pepper-less. I hear you John, that’s exactly what I did: stuffed myself with seafood each possible moment! I am shopping for seeds and found it. Do you think those are the same you have? These apear to be small bell peppers and sweet. I pickled some like that and they are very good. Cherry peppers can range from mild to hot and the ones I pickled were hot, though not terribly so. I’m debating buying seeds from Burpee’s or Generic Seeds. I don’t think I could go wrong with either one. Been there, done that. With a package of chicken breasts, the whole time my brain telling me they were thighs … until they hit the cutting board and I magically snapped out of whatever trance had me thinking they were thighs. This was the day I discovered Kung Pao is actually BETTER with thighs than boneless-skinless chicken breasts — oh the joy! Sardines always make me think of my dad, long passed now. When I was a little girl I would eat sardines, I think in mustard, on saltine crackers with him. Never have I thought to eat them any other way, but your pasta looks tasty! Too funny! I’ll go to my dying day wondering what I was thinking. I can’t complain, though, I honestly enjoyed the pasta that night and will definitely make it again. However, I truly believe that desperate times call for desperate measures and I keep saying to myself that, maybe, finding myself in desperation, I would be able to improvise. Well, enough with the digression! What a nice dish! Sardines don’t get much love, do they? Great way to use them. I sometimes make a Sicilian dish with sardines and fennel, which I’ll probably be posting about in several weeks. But I love the pickled cherry peppers in this! And such a nice variation on pasta aglio e olio, another great fave of mine. In fact I’m about to check out your recipe for that ! 😉 Good stuff – thanks. Thank you, John. As much as I enjoy a pasta Bolognese, I turn to aglio e olio far more times. WIth that as a base, I can make a pasta with just about any ingredients — even roasted tomatoes in the Summer. Of all that I preserved last Summer, the cherry peppers were the biggest surprise. So much so that I’m considering using one of my few planters for them this Summer. I want to have more than a couple jars on the shelf come next Fall. I did the same recently and bought white Basmati rice instead of brown – I think I took my eyes off the target and trusted my hands! I don’t know, MD. I can’t help but wonder what else is lurking in my cupboards. There may be more “mistake pastas” yet to come. I love store cupboard surprise dinners, they can go from sublime to ridiculous – and sardines are almost as tasty as white anchovies 🙂 nice with the Panko crumbs and parsley. Now looking forward to the grilled salt cod …. Thank you. This was a happy accident. I went from missing white anchovies to liking sardines in pasta. I have to admit, it had been ages since I tasted grilled salted cod. It was a real treat preparing it again. I can’t wait to do it again. I hope you’ll enjoy the recipe. I love Aglio Olio and I love the use of bread crumbs. And garlic. And I love pickled cherry peppers. But how do I get over my fear of fish that come in little tins? My friends love sardines, and herring and anchovies and though I like the taste of anchovies I don’t like them whole. And a sardine sandwich – I know those people, too. You need to talk me through this John! But look how well you’ve done! I had to laugh out loud John, your deprecating comments re the packaging. How often has this happened to me? I have stared at packaging trying to determine if it’s the one I want, only to come home and find the word that eluded me so well, right smack in the middle, so visible, you would trip over it. How does that happen? And my vocation is in food package design. Shame on me! I haven’t had sardines for a very long time but I do think I liked them way back when. And of course white anchovies are really a treat (I have a jar in my fridge right now). The pasta looks flavourful and colourful, after all we eat with our eyes first. And the Bartolini breading mixture would add the perfect amount of texture. Very nice. 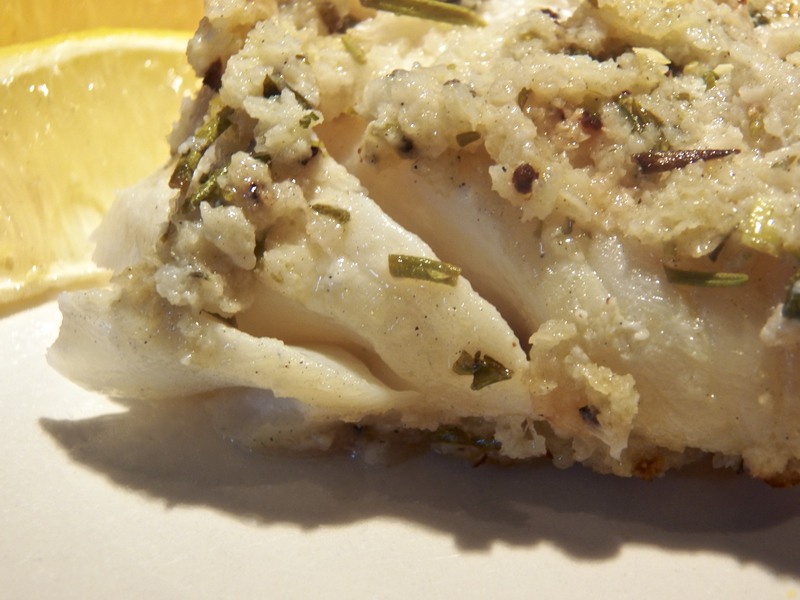 I have to ask a slightly odd question…what is that odd curved line in front of the lemon in the salted cod photo? Great post, John! I love the idea of using breadcrumbs instead of cheese on seafood pasta — I’ll definitely try that and will toast the breadcrumbs in the oven rather than a frying pan because I always burn stuff I try to toast in a pan (patiently waiting and concentrating on one thing at a time is not really my thing). I completely agree on what you write about pasta with garlic, oil, and chile pepper. In fact, I will be making this with broccoli tonight. If I can find good boneless and skinless sardines, I’ll definitely give your recipe a try. Thanks, Stefan, for your kind words. I had to laugh when I read that you burn bread crumbs instead of toasting them in a frying pan. I burnt the first batch of these bread crumbs! The 2nd time, I stood over them because I knew the moment I turned away, they’d burn to a crisp. With all of the Italian dishes you prepare, I knew you’d be one to use aglio e olio as a base for other pasta dishes. It really is a great base and knowing it opens one up to many great-tasting pastas. I just can’t do that — standing over them. I get too bored! Using the oven works like a charm, also for toasting pinenuts or sesame seeds or nuts in general. I honestly cannot remember if I’ve ever eaten sardines, ChgoJohn, and I’m not sure I’d be thrilled with pickled peppers. However, just looking at the picture of your cupboard creation makes me want to dive in. Thank you for this post. Not only have you presented another tasty dish – yet another variation on pasta Aglio e olio, which I love to make – but you’ve reminded me of my Dad in the process. Dad really enjoyed sardines and I like to eat them too, in homage to him. Not to mention, my kids were always horrified to see me eating sardines, which I secretly found amusing. If nothing else, opening a tin of sardines was a way to guarantee myself some peace and quiet for a while.😊 I know that I will love this dish, but I’ll have to make it sometime when the Culinary Enthusiast is on a business trip; he also does not appreciate the humble sardine. Other commenters have written of loved ones that enjoyed sardines, too, Mar. I didn’t expect that when I wrote this post. It’s nice reading comments like yours, seeing that my post brought back warm memories for people. The fact that you like the recipe is, really, icing on the cake. Thanks for sharing your memories with us. Or, you could do what I do when you’re standing in the kitchen trying to figure out the menu – call up this blog…oh wait, I guess that might not work for you 🙂 But it works for me & I think I’m going to do some experimenting with this (not big on super hot stuff, so I’ll go w/the mild & let my husband add his own pepper flakes). Thanks, Diane, that’s kind of you to say. No matter how the peppers are labelled — hot, medium, or mild — taste one before you chop them and add them to the pan. These cherry peppers that I pickled were supposed to be very hot but weren’t. They had just the right amount of heat for me. Looks to me like you are a great improvisational cook, look at what you created! Looks so much better than what I can whip up after staring at my pantry! And the whole reading the package thing…yeah, we all do it. When I saw this appealing recipe my first thought was ‘Who is next coming down from Sydney Fishmarket to bring fresh sardines’? Then had a great laugh when I saw they came from a tin 🙂 ! Wonderfully easy, especially if it is dinner for one!! Methinks have seen filleted ones here, but not so hard to spend a couple of minutes doing the deed oneself! And yes, I was converted to ‘aglio e olio’ as the bestest way to dress pasta a long time ago!!!! Hmm: dinner tonight 🙂 ? John: i have just finished an autobiography you may have already read? If not: put it on the ‘must buy, borrow, pinch’ list! Marcella Hazan’s ‘Amarcord’: have always so admired the lady and nearly ended up in her Bologna cooking School quite some time back! OK, she is from Emilia-Romagna, but that is next to your ‘origins’ and, oh boy, do you two think alike!!!! Isn’t aglio e olio the best? As you’ve undoubtedly found out, once you learn that recipe it can be used in so many ways to dress pasta. And it’s certainly healthier than a cream sauce. I may have found a couple good fishmongers, Eha, but there is no way fresh sardines will make it this far inland. Whether by mistake or intended, the only sardines I’ll be able to get are tinned. Marcella is Zia’s age, living now on the Gulf Coast of Florida and one of the finest ladies [as well as the bestest cooks] I have ever met! The simplicity and purity of her recipes so echoes yours 🙂 ! That’s quite a compliment, Eha. Thank you. P.S. I tried your lemon caper sauce last night (from last week’s recipe??) and it was divine. Fave Husband gave it two thumbs up! If you can learn the basic aglio e olio “sauce” you can cook plenty of pasta dishes, using everything from veggies to seafood, with not a drop of cream. It’s a very handy thing to learn. John, another amazing outcome! And sometimes the unexpected turns out to be the best ever! When I saw the first picture I instantly was salivating the meal. I must admit, I am not a sardine eater. However, this looks absolutely delicious!! 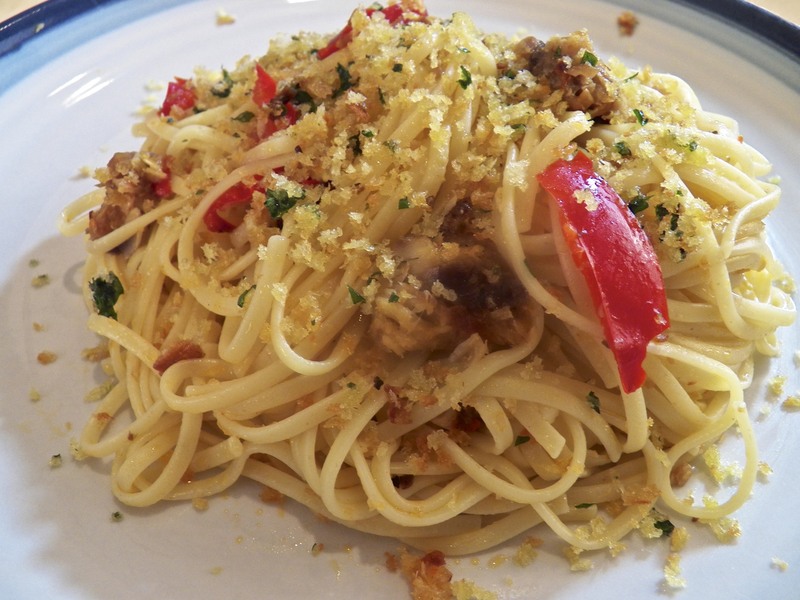 I love the linguine fini, the bread crumb topping, and the cherry peppers! Excellent as always! “Starving into submission” I wish! No, I was going to keep that pasta recipe for white anchovies, no matter what. I really do enjoy it. Funny thing, though, I really like this one, too. Another great recipe. My file of your recipes is growing. My family has enjoyed the ones I prepared for them. I will start taking photos of them the next time I use one. Maybe on Friday I will prepare this one. I’ll let you know. Thanks for all your instructions and the hard work you put into your posts. I hope your “Spam” problems are well on their way to being resolved. I’ll keep an eye on my spam folder, just in case. Have a great day, I’m heading to bed. What a delighful post John! Your pasta looks wonderful, I think that I will have to invest in some canned sardines for a delicious quick dinner when there is little time to cook! Thank you for sharing! curiouse haw it taste, jalapeno peppers??? Like many peppers, they range in heat. Some, in fact, are pretty mild. These were very much like jalapenos. I’m hunting for seeds that will produce hotter cherry peppers for next year. Oh I’ve done that many a time John, picked something up and not realised till later my mistake; just shows I should concentrate more! 🙂 You’re on fine form there John! Sounds like you’re had one great dinner! Since we really can’t get any “good” tomatoes in Winter, I use sun-dried quite a bit. Love ’em. I’m sending away for cherry pepper seeds. Next Summer I’m canning more. They’re so good! Very impressive. On a side note, I have eaten fresh sardines grilled over coals as soon as they are taken off the boat in Portugal. Heavenly. Thanks, Conor. We are way too far inland to have any kind of fresh sardines, let alone to have an experience like yours. That sounds absolutely fantastic, a one-of-a-kind meal. Good for you! Oops..hit the button too quick, but was just going to say that I too often mistake an ingredient…but that’s the mother of invention, for sure! What a great save at the end John. That’s truly what being a great home cook is all about…whether it’s the budget, the “what’s in the cupboard?” dilemma, or simply getting the “wrong” ingredient at the store…it’s the how to run with THAT which separates the good from the great John and apparently you conquered the Sardines with no problem whatsoever. I guess you are now officially ready for “Chopped”. The Bartolini crumb topping I have not doubt will be making an appearance at my house very soon. Take care. You’re very kind, Geni. Chopped fascinates me. I could never compete. I’d make a frittata for the appetizer and pastas for the main and dessert courses. And considering the contents of most baskets, those would be 2 nasty pastas! We love improv at our place and we tend to come up with some really crazy (but good) things that never make their why to the blog. I mean there is only some much crazy gluttony that people can take, right? Kudos to you thinking on your feet and outside of your comfort zone to come up with a delicious dish. Too much “crazy gluttony”? Not when it comes from you, Jed. You’ve not led us wrong yet and I doubt you ever will. Glad you enjoyed the post. I hope you and Liz are enjoying the weekend, too. My sister used to make sardines pasta during the Lent season and now my wife. It’s amazing how something s simple as a sardines, when cooked right creates the most amazing , delicious meal. Great post my friend. Once again, your talent sizzles and excites the taste buds. Another amazing dish. I love pantry pasta. We always have anchovies and I love sardines too. This is right up my alley. Thanks, Greg. I’ve always anchovies on hand but this was a first time use of sardines in pasta. What took me so long! Hi John! This dish looks amazing, turned out to be a blessing in disguise! I am a huge planner as well! I’m always constantly checking the baking/cooking events that I’m participating and trying to scribbling down desserts-to-bake and meals-to-cook in my notebook, then trying to fit the dates so that I can get the posts up on the right dates. It can be both fun and frustrating sometimes! Thanks, Ken. As you certainly are aware, knowing how to make a simple dish like aglio e olio opens up a great many other dishes to you. A great meal needn’t be complicated. I’m embarrassed to say I was just about to eat leftover spaghetti with BBQ sauce! But… You have saved by taste buds. 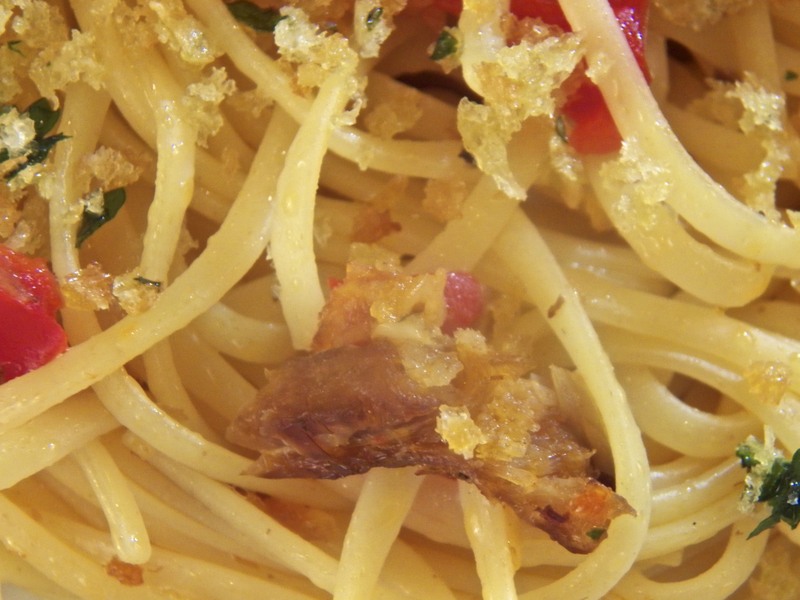 I have spag, I have chili-garlic oil, I have sardines… My tummy’s already rumbling! I certainly hope you did make this for your meal. Buon appetito! I envy people like your Husband, Courtney. That is soo not me. Lucky for you there’s someone like that in your home. Do you rent him out? You could make a fortune! Sardines! Yes, why not? I Loved your version and your presentation of this amazing dish makes me hungry! So glad you enjoyed the dish and took the time to comment. Thank you. I love spontaneous recipes and how wonderful when it ends up being a keeper! We all get lucky in the kitchen sometimes. I love when that happens! Thank you, Susie. 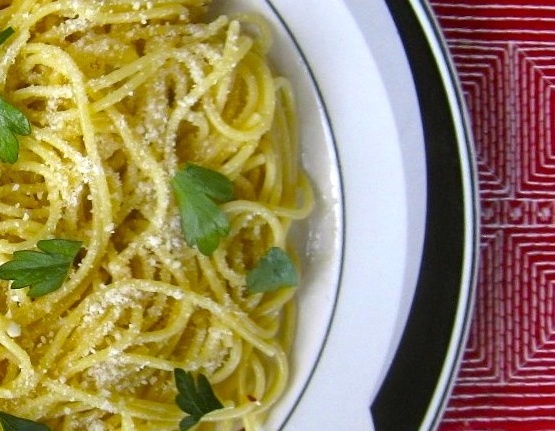 Your seek and create methods are so not me — unless we’re talking about pasta. I can make a pasta out of just about anything — but that’s where my creativity ends. I really don’t keep many pantry items for I haven’t a need to. Now that I don’t work, I can get to a grocery store whenever I need something — like that day’s main course for dinner. I knew that, for many, the sardines in this dish wouldn’t be so well-received. In fact, I’m rather surprised how many people said they liked them. I myself never had sardines as a boy. It was only when I was much older that I first tried them. Had I not bought them by mistake, it may have taken me years to try them in pasta. As it is, I’m glad I made the mistake. This pasta really worked for me. I have opened up many things by mistake. 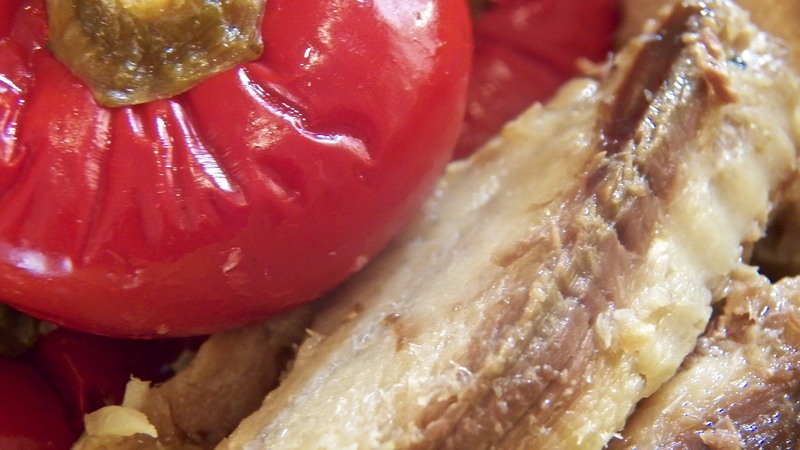 Your creative dish sounds like it was delicious…especially with your homemade pickled peppers for zing.